A David Bowie inspired outfit made out of just under 15,000 plastic straws has been designed by a student at Nottingham Trent University. Saffron Bramley-Astle, who is studying BA (Hons) Costume Design and Making at the School of Art & Design, individually attached the drinks straws one by one and hand-cut them into shape, as part of her final degree show. She designed the piece shortly after the death of David Bowie and it took her three months to complete the outfit. “I was inspired by the great legacy that David Bowie had left, not only on the world of music but also through his iconic looks particularly that of his Ziggy Stardust character,” she said. Saffron, of Derby, became more intrigued by the creation of costumes through use of unconventional materials, so decided to make the outfit out of straws. 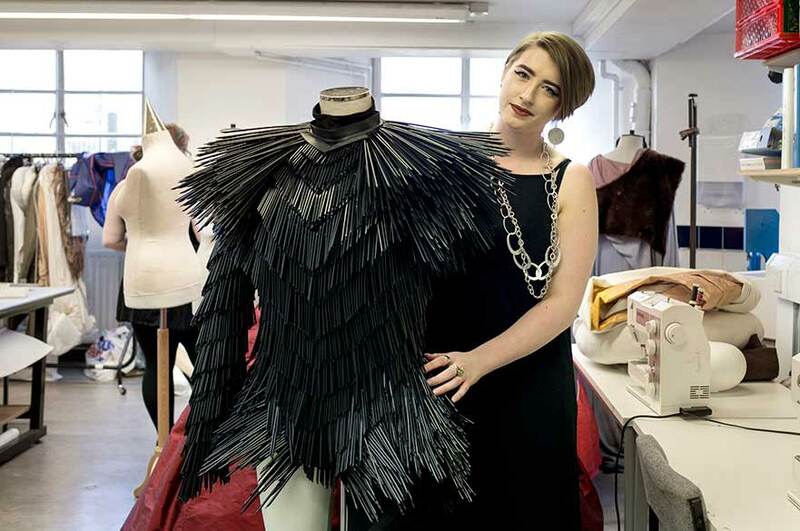 “I started to find out how I could develop the idea of using straws further and use them to create interesting movement and texture in a costume,” she said. Saffron Bramley-Astle’s work is set to go on show at the university’s 2017 Degree Show from 3 to 10 June at the City campus.